That a quiet and reliable brandname fan doesn't have to cost much has been proven by us for years with the Blacksilent series. The ideal compromise between noise levels and power and the low price have made the Blacksilent fans the best-selling silent fans on the market! Upon frequent customer requests we now offer the XM1/2 in the format 40x40x10mm. Of course these fans also use the superior (((NB))) technology. Almost inaudible and extremely long-lived NB-Longlife bearings and a high-grade NB-EKA motor result in an unbeaten failure rate of only 0,01%! The (((Noiseblocker))) BlackSilent series is one of the most affordable and reliable fan series on the market. The fans were developed in Germany and feature an outstandingly low noise emission as well as great reliability. Unlike with many cheap far-east made fans the noise level remains at it's low level for years. The reason is the choice of material and precise manufacturing methods. 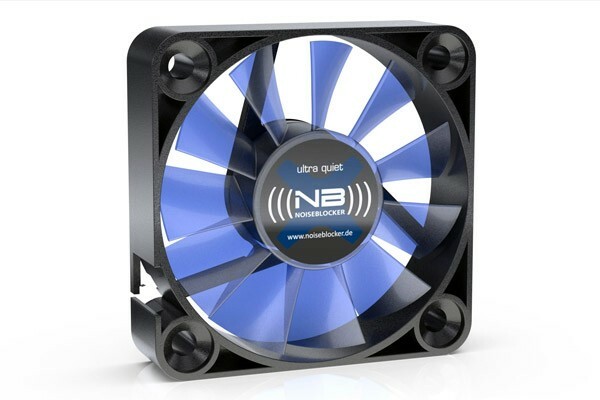 Unlike 95% of the so-called ''fan manufacturers'' (((Noiseblocker))) develops all fans in-house and uses only high-grade parts even in the ''cheaper'' series. The Blacksilent fans were designed to be more simple but just as reliable as the more pricey fan series. With the Rev. 3 of the BlackSilent fan series you purchase a quality product which is optimized for low noise emissions. The fans are available in the sizes 40, 60, 80, 92 and 120mm. Of each size two versions are available: The 1-series is virtually inaudible and suitable for standard systems. The 2-series has very low noise emission an is powerful enough even for very potent systems. MTBF (25°C) : 20 000 hrs.